A new file could have been added by an external script, e.g. 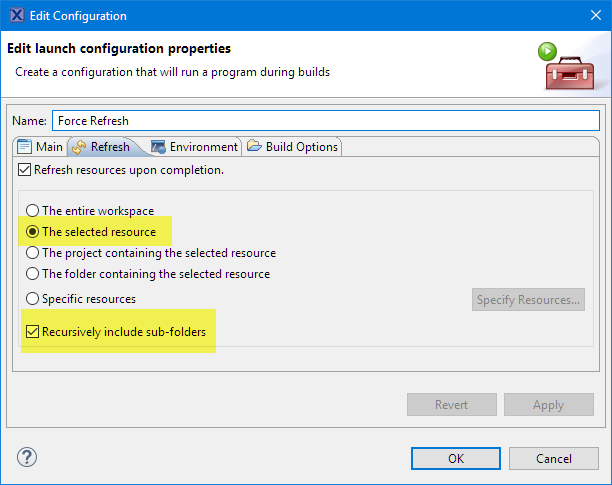 to generate new source file with a pre-build step with a time stamp or any other build related information. 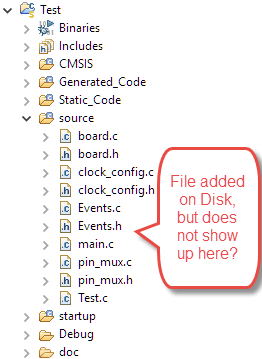 If that file is always new and does have a different file name, Eclipse is not aware of it. So I need to make sure the Eclipse project ‘knows’ about it before the build. So I need to ‘refresh’ the project or workspace before the build. In this post I’m using Eclipse Neon 4.6 with the example of MCUXpresso IDE, but any other Eclipse distribution or version can be used. But this is a manual process. What I would like to do this automatically before every build. So this does not help. This will do extra polling in the background, or when I access the files/folders in the project view. It works that way, however because of the polling this adds more load to my host system, especially with many open projects in the workspace. Plus it is for *all* projects in the workspace. What I need is something just for a single project. With this, the action (either a dummy action or the action to create a new file with a timestamp) will cause a refresh of the selected (project) folder and all folders inside (recursively). Done :-). I love Eclipse because it can do pretty much everything. With the custom builder settings I can do custom actions before (or after) the build without the need to manually write make or build files (but make files are still very, very useful). 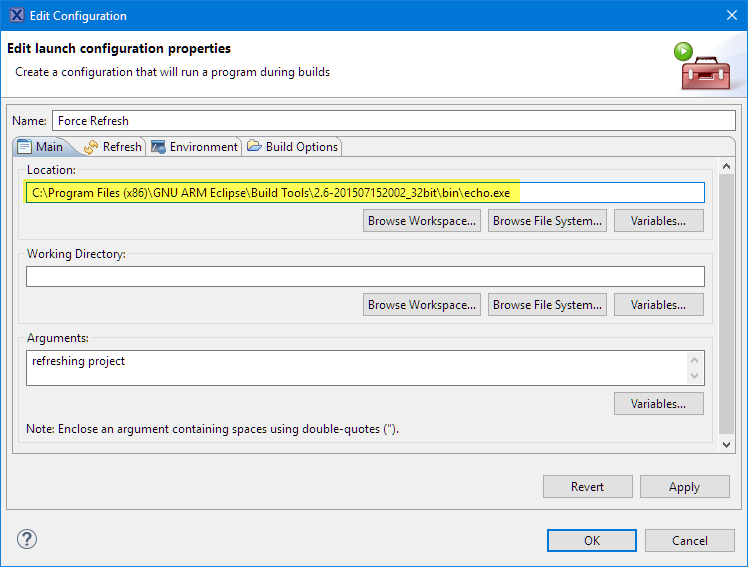 This entry was posted in Building, Eclipse, Tips & Tricks and tagged Build Action, Building, CDT, Eclipse, Refresh, technology, Tips&Tricks by Erich Styger. Bookmark the permalink. “I love Eclipse because it can do pretty much everything” – interesting you say this; I found the “walled garden” file system of Eclipse to be about it’s worst feature. In CodeWarrior if I wanted to create a new variant of a project, I just copy the directory; if I want to change files, I just change them. In Eclipse, all these simple file things become a chore, for reasons that I don’t know or see the benefit of. Admitted, I did find ways to get around all the barriers, so I suppose it *can* do everything; just maybe not as easily as it should be. Hmm, I don’t see any ‘walled garden’ file system in Eclipse? 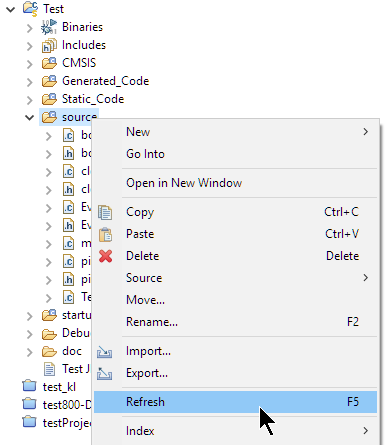 If I want a new project, then I can simply copy it too (Ctrl-C, Ctrl-V) in Eclipse (or outside Eclipse). It is true that Eclipse uses (as other IDEs) information in .project and .cproject files, but as they are text files, they can be easily managed too. However, what I agree is a constant pain is the separation between ‘Eclipse Framework’ and ‘CDT’ (for C/C++ development): the framework does not know that CDT does and vice-versa. 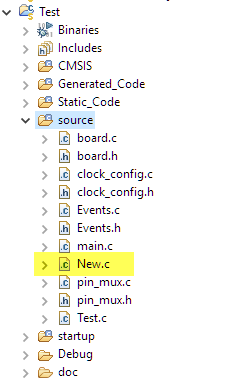 This for example is the source of pain for the debug configurations, where the connection between the editor/framework and the debugger is very thin. Same between build tools and editor. Maybe this is what you observe? 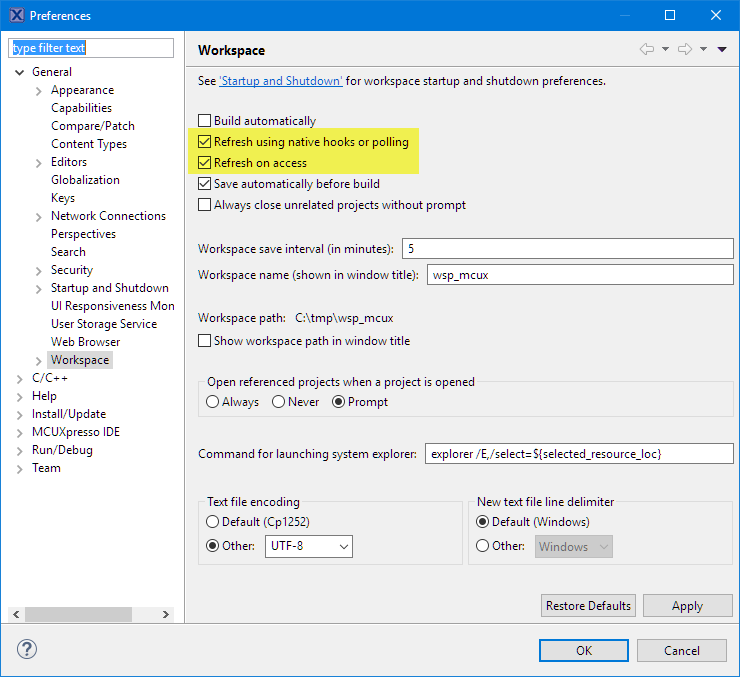 In that case, I recommend that you enable the refresh in the workspace: that way it poll the file system for any changes. That’s the same thing CodeWarrior (classic and Eclipse based) can do too. Thank you. It helped me a a lot. There is only one issue. echo.exe cleans console and prints “refreshing project”. Is there any way of appending text on console because I also want to see file sizes? sorry to bother you, but I’m dealing with this for quite a bit now. 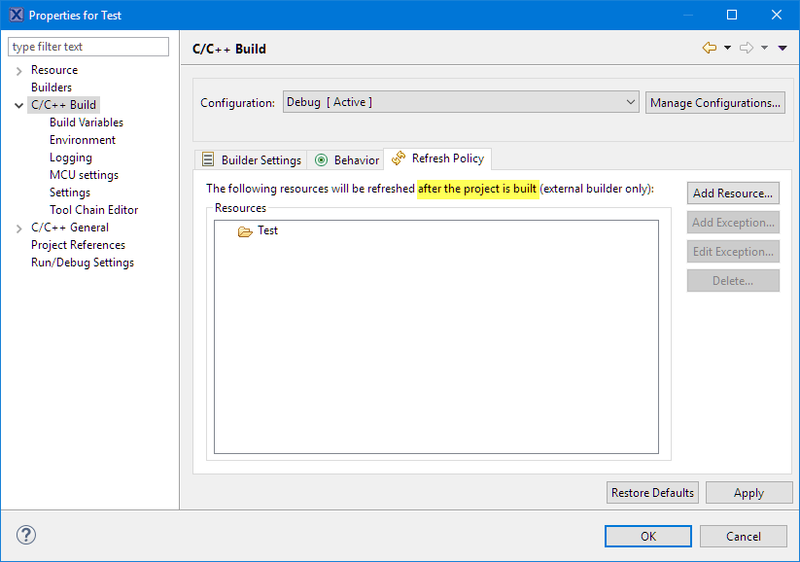 I’m trying to automatically increment a constant BUILDNUMBER using a CDT Builder. So I wrote a C# application that find this constant and increment it, but I’d like to only do that if the Build Configuration active is Release, not when it is Debug. So, how do I pass and deal with this information at my C# program? 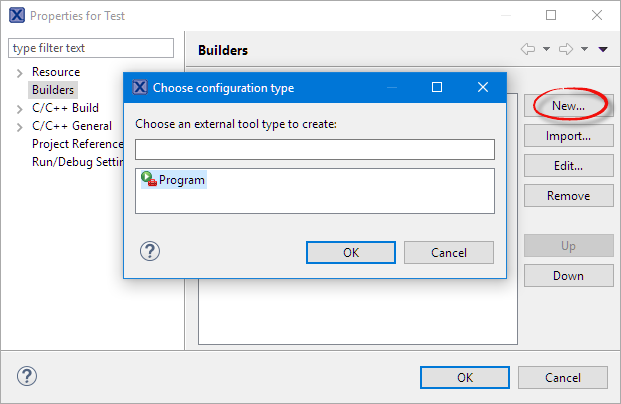 I see that at my CDT Builder->Main there’s an “Arguments” which I can select “config_name” that is the information I need to pass to my application, but I couldn’t figure it out. 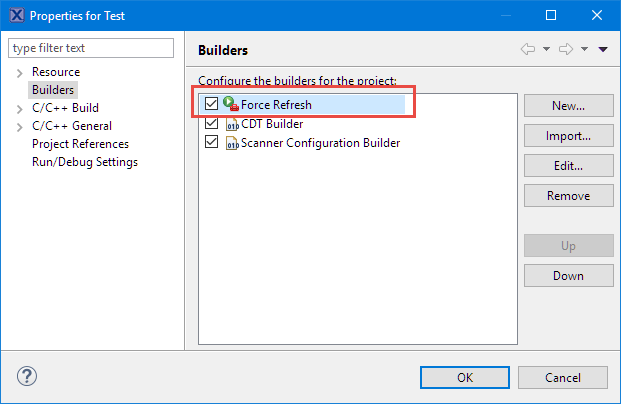 I would have have used the SRecord tool (http://srecord.sourceforge.net/) to run after the build and to increment that constant? That way you would not have to worry about CDT? Thank you for your answer Erich.